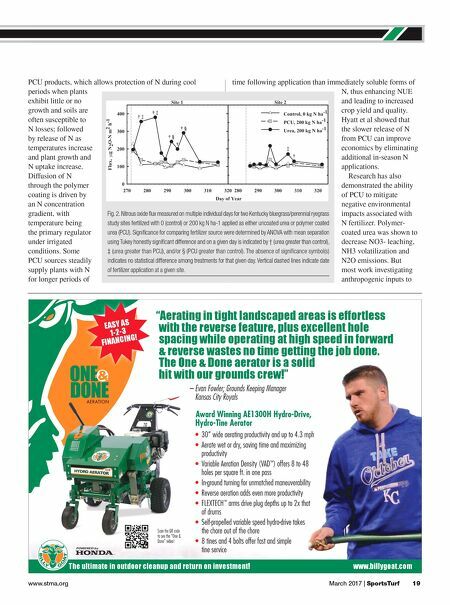 18 SportsTurf | March 2017 www.sportsturfonline.com USING POLYMER-COATED UREA FOR AESTHETICS WITH LOW ENVIRONMENTAL IMPACT ■ BY JOSHUA LEMONTE, PHD, BRYAN HOPKINS, PHD, & VON JOLLEY, PHD In addition to the environmental impacts of excess N, manufacturing N fertilizer uses natural gas and other non-renewable resources. Thus, minimizing N losses and maximizing plant utilization are beneficial in conserving non-renewable resources and environmental quality. Effectiveness of N uptake and utilization by plants is defined as nitrogen use efficiency (NUE). Optimizing N fertilizer rate, source, timing, and placement are all essential to reach an ideal balance between grower profitability and NUE. One tactic to increase NUE is use of controlled- release or slow-release N fertilizer. These sources release N into the soil over an extended period of time to ideally matching plant needs and possibly reduce or eliminate labor-intensive, costly in-season N applications. By controlling the release of N from fertilizer, N inefficiencies and losses to the environment should be mitigated via increased N retention by the soil and uptake by the plant. The concept of controlled or slow release N fertilizers is not new, but success has varied across plant species and environmental conditions and expense has prevented wide utilization. More recently, cost of these products has become more competitive with traditional N sources and, as such, adoption is increasing. Polymer- coated urea is one promising type of controlled release fertilizer that provides improved N-release timing. Soil temperature controls N release rate from certain N itrogen is an essential plant nutrient in the biosphere but is also a common pollutant in the atmosphere and hydrosphere. Nitrogen can be lost from soil to the atmosphere as NH3 or N2O gases or to the hydrosphere as NO3. 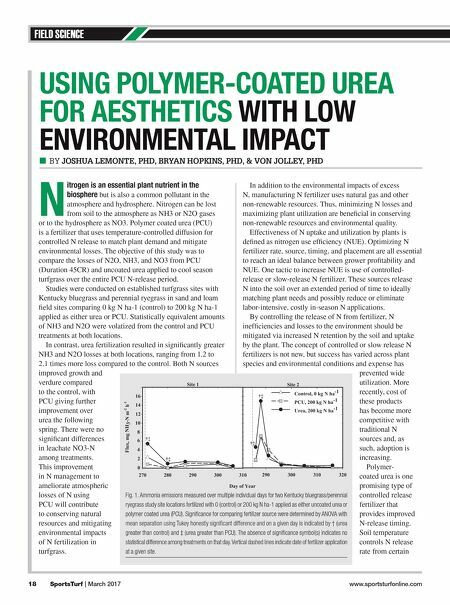 Polymer coated urea (PCU) is a fertilizer that uses temperature-controlled diffusion for controlled N release to match plant demand and mitigate environmental losses. The objective of this study was to compare the losses of N2O, NH3, and NO3 from PCU (Duration 45CR) and uncoated urea applied to cool season turfgrass over the entire PCU N-release period. Studies were conducted on established turfgrass sites with Kentucky bluegrass and perennial ryegrass in sand and loam field sites comparing 0 kg N ha-1 (control) to 200 kg N ha-1 applied as either urea or PCU. Statistically equivalent amounts of NH3 and N2O were volatized from the control and PCU treatments at both locations. In contrast, urea fertilization resulted in significantly greater NH3 and N2O losses at both locations, ranging from 1.2 to 2.1 times more loss compared to the control. Both N sources improved growth and verdure compared to the control, with PCU giving further improvement over urea the following spring. There were no significant differences in leachate NO3-N among treatments. This improvement in N management to ameliorate atmospheric losses of N using PCU will contribute to conserving natural resources and mitigating environmental impacts of N fertilization in turfgrass. FIELD SCIENCE Fig. 1. Ammonia emissions measured over multiple individual days for two Kentucky bluegrass/perennial ryegrass study site locations fertilized with 0 (control) or 200 kg N ha-1 applied as either uncoated urea or polymer coated urea (PCU). Significance for comparing fertilizer source were determined by ANOVA with mean separation using Tukey honestly significant difference and on a given day is indicated by † (urea greater than control) and ‡ (urea greater than PCU). The absence of significance symbol(s) indicates no statistical difference among treatments on that day. Vertical dashed lines indicate date of fertilizer application at a given site.